Sometimes it is necessary to discard messages from the queue, or discard traffic to a domain or group of domains. While it is preferable to use the built-in methods for that, sometimes this is not possible. This document explains a way to create a Drop Route that will silently drop messages sent to it. 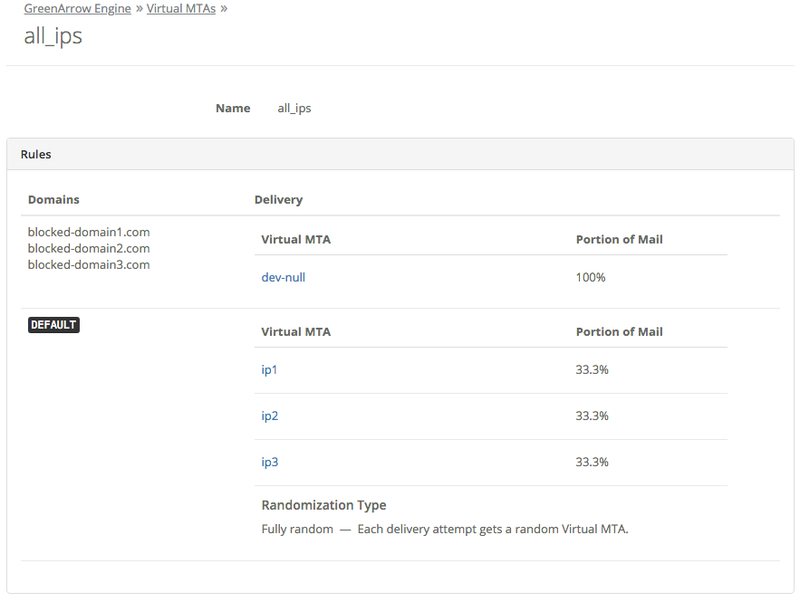 This route can then be used to drop messages from your campaigns by using Engine’s routing rules or by redirecting existing VirtualMTAs to the Drop Route. If you are not familiar with GreenArrow Engine routing rules, relay servers or VirtualMTAs then don’t try any of these methods. If in doubt, contact technical support. If you want to discard all messages from a campaign try dumping the queue first. If you want to filter a domain or group of domains, try filtering them from the source. For example, GreenArrow Studio has a segmentation option to filter out subscribers that belong to certain domains. Other applications may have similar options. You can also use Special Sending Rules in GreenArrow Studio to skip messages that match criteria written in the SSR code. If you want to bounce messages already injected into GreenArrow Engine, try running custom code during delivery attempts. Using this method you’ll need to write code that checks the destination domain and returns a dump action, which forces GreenArrow Engine to bounce the message. The Drop Route is a relay server that delivers messages to the internal SMTP Sink service. 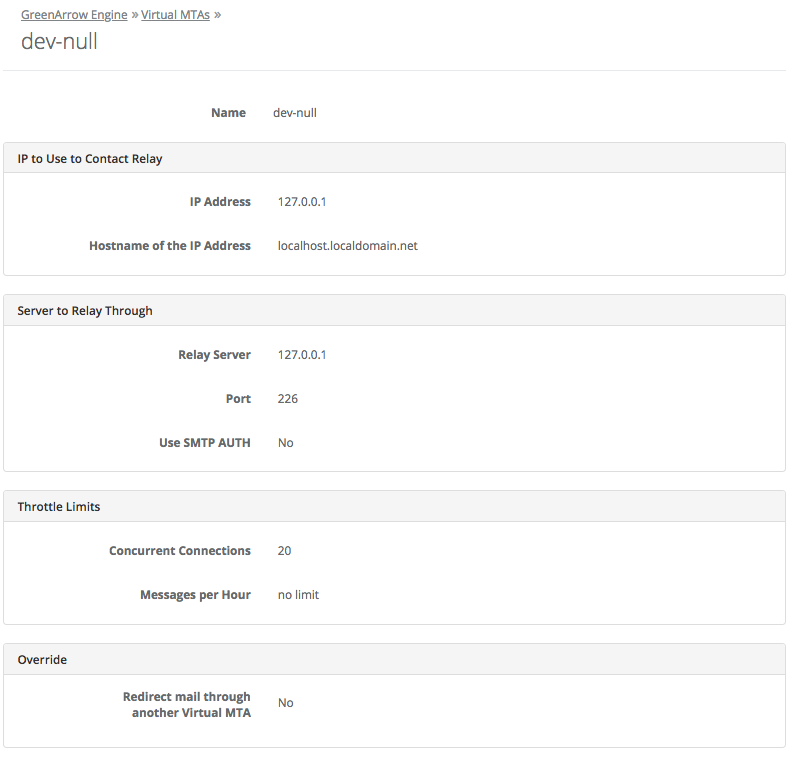 The SMTP Sink is a service installed on all GreenArrow systems, it is an SMTP server that listens on localhost TCP port 226, accepts any messages sent to it and silently discards those messages. From the point of view of the server that is sending messages to this service, the messages are delivered, therefore, if GreenArrow delivers to the SMTP Sink, the messages will be marked as accepted, i.e. they won’t generate a bounce. IMPORTANT: Messages sent through this relay server will be silently discarded. This means that the email will show as a Successful delivery in the stats but will actually be deleted, and this will happen without a corresponding bounce message. There will be times when you need to discard messages that are coming into the MTA or that are already in the queue, but you don’t want to affect other messages in the same campaign or you want to apply this to multiple campaigns. If the instructions to dump the campaign’s queue do not apply to this case then perhaps the Drop Route can be used to discard those messages. Let’s assume that you are sending a campaign that uses the routing rule all_ips, which has 3 IP addresses. Since BIG ISP is deferring your delivery attempts, you decide to drop all messages to those domains: blocked-domain1.com, blocked-domain2.com, blocked-domain3.com. NOTE: This rule will immediately affect new messages that use the VirtualMTA all_ips and any messages that are in the queue with that routing rule. And it will apply to all campaigns. You are using an external relay server named external-relay, and you decide that all messages to that relay server should be discarded. To do this, edit the relay server, scroll down to the Override section, check Redirect mail through another Virtual MTA and select dev-null from the dropdown box. Save the relay server and messages to that relay server will be discarded. Don’t forget to disable the override once all the messages have been discarded. NOTE: this method can also be used on IP address VirtualMTAs too.